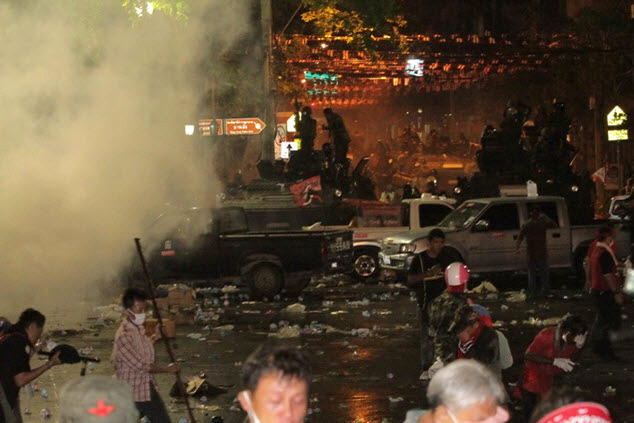 Unfortunately, what the Army had hoped would be a relatively easy and bloodless campaign to clear the Red Shirt protesters from the Ratchadamnoen Avenue area in the old city has been suspended after two overnight attempts left fifteen people dead and more than 670 injured. The dead are reported to include four soldiers and eleven civilians including a 43-year old Japanese photojournalist. Above: protesters flee in the face of teargas dispersed by the Army along Ratchadamnoen Avenue. The protesters at the Ratchaprasong intersection, the heart of the business and commercial district, are still in place. This is the strategically more difficult position for the military to access and protesters have blocked the roads with trucks and other barricades. Police and protesters face off on Tuesday along Rajadamri Road underneath the BTS Skytrain station looking north towards Ratchaprasong intersection. This is the worst political violence in twenty years in Thailand and begs the question of how a resolution will be reached. Tawn and I leave this afternoon for the week and are worried about how this impasse will be broken. No doubt it will be, but at what cost? Update: After a previous entry about the protests, Jason had asked whether or not this is basically a class war, as that is the way it is portrayed in some foreign media. It really isn’t. In fact, Voranai Vanijaka, a Thai columnist in today’s Bangkok Post, summed it up very astutely: “In the present strugles, the new elites are making pawns of the poor and the old elites are making pawns of the middle class.” It really is more about a struggle between two groups of elites for control of a society that is very much a patronage society. The Red Shirts represent the new elite. This entry was posted in Uncategorized and tagged Bangkok, Krungthep, politics, Protests, Red Shirts, Thailand by christao408. Bookmark the permalink. Oh please tell me you did not take those photos! I hope things are calm by the time you two return home. How far is your place from all this upheaval? @murisopsis – Sorry, I should have clarified that those photos are from the Bangkok Post. I did not take them. Our place is about five Skytrain stops (say 3 miles in a straight line) from the bottom photo and about 6 miles from the top photo. OMG Chris, please be careful. Can you imagine how worried your mother must be? Please don’t go any where near these red shirts. 15 dead? What a tragedy! @ZSA_MD – We are leaving in a few hours on an already-scheduled trip to Macau and Hong Kong. The timing is very fortuitous. Good to stay away from that mess! Have a good trip! great summary! Hope you and Tawn have a safe trip away from all the troubles. I worry it may not be solved in a week, unless there are military rule. It is scary when the country is shooting and killing their citizens en mass. 😦 Glad in USA, people do disagree in politics, but we seldom turn violent. wow… stay away from the danger zone… hope things will get better…stay safe. Hope this political chaos will end soon. Have a pleasant trip! New Elite Vs. Old Elite- sums up really well. 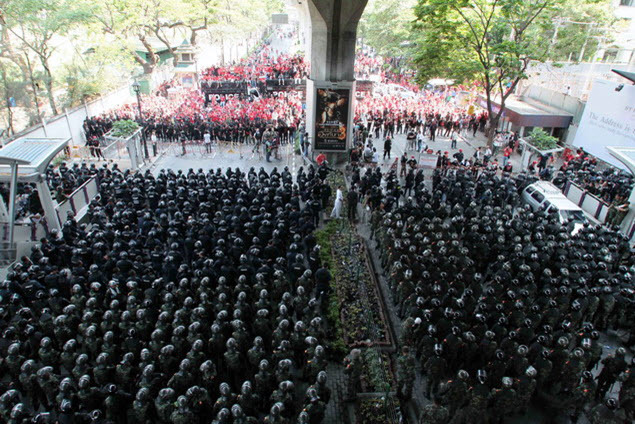 i never thought i’d seen the day when a protest in thailand would result in deaths. i mentioned how civilized the protests in thailand in comparison to its neighbors, i guess i spoke to soon. @christao408 – I am really happy to hear that. Have a great trip. stay safe. things can get pretty scary and uncontrollable during these times. lucky you are flying out of there!i didn’t know the detail of the story, so i really appreciated your explanation. @Renatojr3 – Yeah, although if you stay out of the conflict zone it isn’t too bad. @stepaside_loser – You’re very welcome. I’m glad we’re away for a few days, too. wasn’t there the yellow shirts before? @ElusiveWords – Yes, those are the royalists who generally support the current government. We’re lucky they aren’t on the streets, too, otherwise we would have a civil war – no joke.